I teamed up with the awesome crew at Surf Yoga Beer for their weekend fitness adventure to Hudson River, NY. Surf Yoga Beer knows how to do a weekend retreat right; just take one look at their lineup of action-packed adventures to exotic locations like Cuba, Nicaragua and Costa Rica! SYB was started in 2014 by Mantas Zvinas, the company’s designated fitness guru and the ultimate party starter. He has a unique way of making even the toughest workouts fun, which inspired the concept for Surf Yoga Beer’s international fitness adventures and local NYC events. With the help of Mantas’ equally amazing partners, SYB has grown into a culture of motivated, wellness-loving individuals who love to have FUN! Check out their website to learn more about their local NYC events and incredible upcoming trips. I was invited to join their team on their weekend getaway to Hudson River to share my nutrition-savvy tips. I felt like it couldn’t have come at a better time, as wellness and nutrition have recently played a huge role in my life. My close friends know that I follow a pretty strict diet due to food intolerances. Throughout my entire life growing up, I was able to eat whatever I wanted, until suddenly I developed severe allergies that made it painful to eat just about anything. Since then, I’ve done a complete 360 degree flip on my diet, but in doing so, I’ve learned so much about how to cook the right foods to nourish your body and feed it what it needs. I was thrilled to share my love for healthy and simple meals and hopefully encourage the group with my recipes! *Disclaimer*: I am not a Registered Dietitian or Nutritionist; I have been inspired by my personal dietary restrictions to seek a happier and healthier relationship with food. This ongoing journey has made me passionate about sharing the simple things that have helped me improve my health. Figuring out what works for your body is absolutely different for everyone and I always suggest doing your own research. The week before the Hudson River trip, I met up with Eddie Larios, SYB Partner and Owner of NYC restaurant Salud, to plan out the weekend’s menu and some “Nutrition Do’s and Don’ts” to share with the group, which you can find at the bottom of this post. Our goal was to develop quick, easy recipes that they would actually use once they’re home. With Eddie’s kitchen expertise, we came up with a fantastic menu that would change the way the group viewed meal prep. Unsure of what to expect, I (over)packed my bags with lots of fitness gear and my camera (stay tuned for a SYB Hudson River Vlog!). Going on a weekend trip not knowing anyone can be a little scary, but you can’t help but leave with new friends by the end of a Surf Yoga Beer adventure! We met up with the leaders for the weekend, Mantas, Eddie, Mike & Marcos, in Union Square and hit the road for Hudson River. It took us about two and a half hours to get there and once we arrived, all 20+ of us took to exploring the scenic property. The house was insane in the best way possible; from the vast amount of rooms, to the ultimate party/game room, and the perfectly manicured yard, this was the ideal getaway spot. One of my favorite parts was that when you stepped outside, it was quiet except for the sounds of nature; something you never hear in New York City! After settling in, it came time to start prepping the kitchen for Friday night’s dinner. Eddie and I took off to stock up on more groceries, while the group did one of Mantas’ killer Booty Camp workouts, followed by an evening yoga flow and meditation by the water. Lucky for us, the local grocery store, Tops, had everything we needed. Being in a small town, we could have easily been out of luck with an AVG grocery store, so we were ecstatic. I even got to drive the van!!! The majority of our meals had a heavy focus on vegetables with a meat option. We wanted to show the group that you can create a well balanced meal focused on the wonderful nutrients from vegetables that won’t leave you hungry. Ricotta & Spinach Stuffed Portobellos: Trader Joe’s sells pre-packaged portobello mushrooms that make meal prep TOO EASY! Simply wash them, take out the center core and roast them in the oven for about 20 minutes on 375 degrees Fahrenheit. Separately, sauté spinach on the stovetop until it wilts and then add in ricotta cheese. Fill the portobellos with the ricotta/spinach mixture and voila! Roasted Broccoli with Garlic: This was one of the group’s favorite sides. Some even asked how long it took to cook this because it was packed with so much flavor, but there are only four ingredients: olive oil, salt, pepper and garlic. Be sure to coat each broccoli piece completely with the added ingredients and roast them in the oven for about 20 minutes on 375 degrees Fahrenheit. Kale Salad with Roasted Peppers & Cabbage: I really value the simplicity of meals made with pure, natural ingredients and this salad is the perfect example! We used Trader Joe’s pre-packaged kale, cabbage, and cherry tomatoes, along with oven roasted red peppers. To give this salad a kick, Eddie taught me a simple dressing recipe that I know I’ll be using all the time: In a bowl, combine about 3/4 cup of olive oil with about 2 tbsp of Grey Poupon mustard, salt and pepper. Mix together and either mix the dressing into the salad or keep the side. Barbecue Chicken: I love to include a source of protein in my meals and Eddie is known for his amazingly fast preparation of flavor-packed food, like this BBQ chicken. He simply coated the chicken in olive oil, salt & pepper, lemon, and BBQ sauce and stuck it in the oven. Cauliflower Rice & Quinoa: We even found a way to add veggies into our carbsTrader Joe’s sells cauliflower rice that we mixed into our quinoa after it was cooked. Cauliflower is great for improving your digestion and quinoa is an awesome source of protein. The group started off their morning with another workout and run with Mantas, while Eddie and I prepped Smoothie Bowls for breakfast. This was our favorite meal to prepare because it took no time and come on, who doesn’t love a smoothie topped with ALL of your favorite fruits?! Plus, it’s a totally Instagrammable moment! Pancitos with Bruschetta and Ricotta & Honey: To make pancitos, aka “Little Bread”, slice and toast a baguette and then add bruschetta (diced tomato and basil) on half of the pieces & ricotta topped with honey on the other half. The ricotta pancitos were my favorite; the perfect mix of savory and sweet! This recipe is great for any occasion, like when it’s your turn to bring an appetizer to a party! Roasted Potatoes with Herbs: Baby potatoes are a great side for any breakfast and the perfect post-workout carb. Coat them in olive oil, salt & pepper, and spices like rosemary or thyme, and roast them for about 45 minutes. Boiled Eggs: Last but not least, the protein of the meal! Boiled eggs are a great staple to keep on hand for breakfast or snacking throughout the day. After breakfast, some went for a 4 mile run with Mantas, while others hung out in the backyard to enjoy the sunshine. One of my favorite parts of the weekend was relaxing on the dock with a specially crafted citrus drink courtesy of Eddie’s cocktail making magic! We all hung out by the water for a few hours to tan, float in the river, and kayak. This post-tan/ pre-nap lunch was kept light to leave room for the huge dinner that was ahead! Romaine Lettuce Wraps with Chicken and/or Beef: Lettuce wraps are a great alternative/Gluten Free option for an open faced sandwich. We provided two options for a lettuce wrap: chicken and veggies or ground beef with zucchini noodles. Gourmet Grilled Cheese: A NOT UR AVG twist on the typical grilled cheese included mushrooms, onions and gourmet cheese. Cucumber Kale Salad: Mixed with kale and tomatoes, this salad was kept light and refreshing with the perfect summer veggie, cucumber. You know the meal’s good when the whole dinner table is quiet! The second night’s dinner was definitely the crowd favorite. Eddie and I went all out cooking all of the leftover food we had in the fridge to make this last dinner at Hudson River the best it could be. My favorite comment that someone made was that even though the meal almost entirely consisted of vegetables, it was still super filling and packed with different flavors on top of those amazing nutrients. Chicken and Veggie Skewers: I was so looking forward to making these when I first heard that the house had a grill! I picked out some of my favorite veggies to grill, peppers and zucchini, chopped them into big pieces, cut boneless chicken into cubes and placed them on the wooden skewers. Tip: Soak the skewers in water before putting them on the grill! This will help them survive the heat of the grill without burning. Carnitas with Xochitl Asada Verde Salsa: Carnitas are “little meats” typically prepared shredded in tacos. We gave the group the option to make their own taco with these organic carnitas coated in spicy verde salsa. The Xochitl brand salsa adds a great punch of flavor and takes all of the work out of preparing a homemade salsa. Roasted Asparagus, Carrots, Parsnips, & Butternut Squash: Roasted vegetables are my specialty; I shared with the group how easy it is to coat them in olive oil, salt & pepper (and your favorite herbs/spices), throw them in the oven for about 20 minutes, and you’re DONE! This saves me on weeknights when I’m too to get groceries for a meal. I often purchase frozen carrots and squash from Whole Foods so that my freezer is always stocked and I can just pop them in the oven when I get home. Grilled Corn on the Cob: Because what’s better than corn on the cob in the summertime?! Chips and Guacamole: When someone asked for chips and guac, Eddie was ON IT. I’m not sure I’ve ever seen someone whip up guac so fast! Using several avocados, add in squeezed lemon juice cilantro, and salt and pepper for extra flavor. Avocados are packed full of vitamins and minerals and are a great source of healthy fat. The group finished the night hanging out & dancing in the game room and some even stayed up until the a.m. when it stopped raining to cook s’mores! Just look at this view! Our final morning at Hudson River couldn’t have been more scenic. After we all got up for the final SYB wake up call, we all had our coffee on the dock and took in the view one last time. After we all had a little more energy, Mantas led us in an ab workout, which was quick but super effective! Grilled Veggie Omelette Cups: Omelette cups are an excellent low-calorie alternative to a heavy egg breakfast. Grab a muffin pan and crack 1-2 eggs into each spot and add your favorite veggies to the mix. We added spinach, asparagus and mushrooms to ours! Warm Cinnamon Oatmeal with Toppings: Warm oatmeal is my go-to breakfast. It’s light on the stomach if you’re planning to go workout and, like smoothie bowls, you can top them with your favorite fruits. Grilled Chicken Sausage: Another great source of post-workout protein that we simply popped in the oven to cook! Although we didn’t want the weekend to end, we said our goodbyes and exchanged numbers & hugs back in Union Square. I had an unreal experience with Surf Yoga Beer and meeting the incredible individuals who were on the trip. I learned so much about my own abilities to cook for a large group and share my passion for nutrition & well being and I cannot thank the SYB team enough for that! 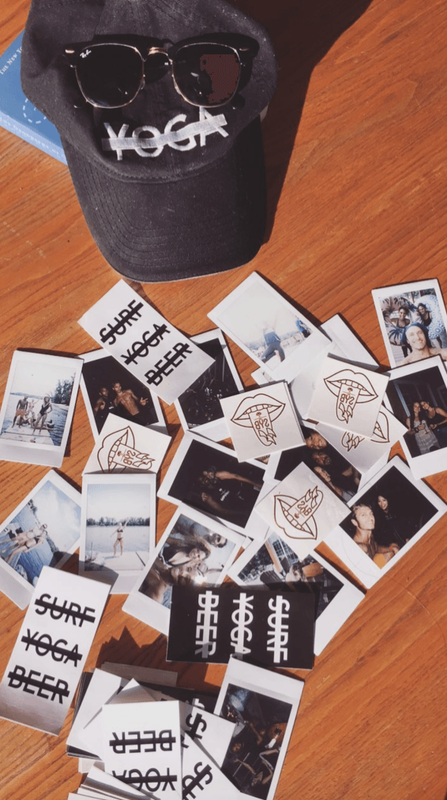 I hope you enjoyed reading about my trip with Surf Yoga Beer as much as I loved the weekend itself! The SYB community is full of active, fun-loving people that I’m so lucky to have met. It was such a unique experience to be able to cook for a large group of people and to open up about my nutrition story. 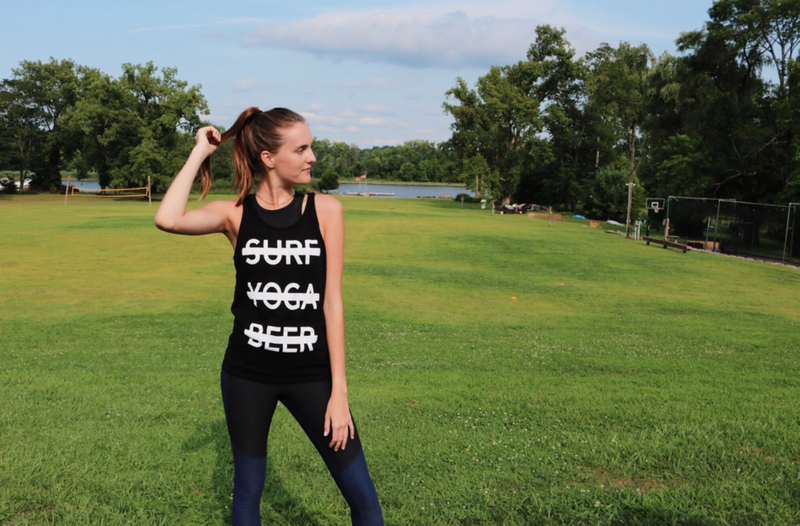 Don’t hesitate to reach out if you have any questions about my experience and I highly recommend looking into Surf Yoga Beer’s fitness adventures in NYC and beyond! Check out their Labor Day retreat to Hunter Mountain and upcoming Hudson Valley trip. JAMIE WILKINSON - Born and raised in sunny South Florida, Jamie is currently based in New York City pursing a Masters degree and sharing every new experience on her lifestyle blog, NOT UR AVG. Her passion for nutrition and wellness were inspired by food intolerances that developed her love to cook. Don't be AVG and wait until the New Year to make that healthy change in your lifestyle; check out her and her BFF's blog, www.noturavg.com, to get all the inspo you need to be your best self!